Two new releases this week!! First, Covet Thy Neighbor, book #4 in the Tucker Springs series, is available from Riptide Publishing, Amazon, Barnes & Noble, AllRomance Ebooks, and Rainbow Ebooks. 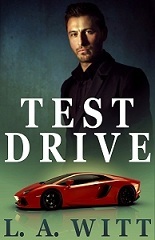 Also, Test Drive, a contemporary short story, is available from Amber Allure. Additional links will be added here as they are available. This story is part of the Office Affairs Amber Pax, and can be purchased individually or along with the other stories by Heidi Champa, Christiane France, Sean Michael, and Anne Brooke here. Sean Waters is down on his luck thanks to the economy, and winds up working for his domineering father’s car dealership. It’s not the greatest job, but it’s a paycheck. The only problem? He’s got a wicked crush on the general manager, Jackson Shaw.